You might have seen a few weeks ago, I posted about a campaign on the Duracell Facebook page where people are inspired to try new things and share their goals. Duracell also invited me to learn a new skill. I LOVE making cakes, but definitely lack the skill and patience to make them pretty. My sponge is good, but my decorating skills were pretty much limited to piping icing and adding sweets. 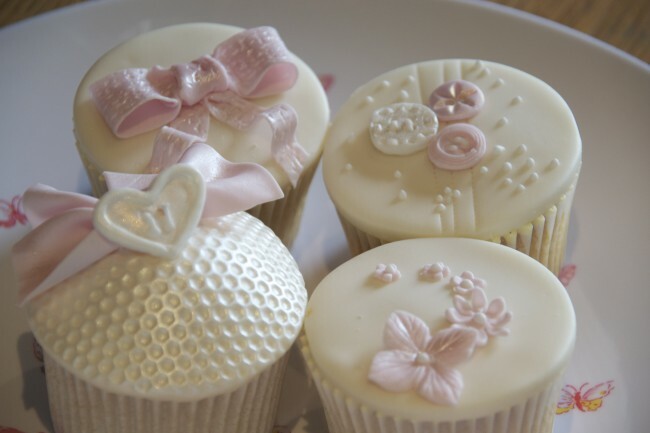 I chose to attend a an elegant cupcake decorating class at The Cake Makery in Fleet. My expectations of my own skills were low and I wasn’t expecting to make anything I’d be pleased with. It is amazing what the right tools, peace and quiet and a good teacher can do. I REALLY enjoyed having the time to concentrate without fending off children wanting to eat the icing and actually taking the time to make something look good. I have set myself a new challenge. This week is H’s birthday party, I want to make similar cupcakes but with bright coloured ribbons on them to match her ‘crazy tea party theme’. Keep your fingers crossed for me. Huge thanks to Duracell for giving me this opportunity. Wow. These look amazing Emma. I’m seriously impressed. I’d love to do a class and get better at icing, it can make the difference between an okay looking cake and a thing of beauty. they look so stylish! I also wish I had the time to do these kinds of creative things just for me. Looks like you may have a new hobby…. i thought so, until I tried at home …it was a disaster! Mammasaurus recently posted..16. How does your garden grow? Oh my word they are BEAUTIFUL! I love the buttons. Liz Burton recently posted..Where do fish come from? Wow Wow Wow! These are amazing, I would totally pay money for this standard. Did they taste as delightful as they look? These cakes…yum!!!! I would love to take a class like you did too! These are so so awesome. I am not creative but I am going to try! Oh my word, how good are those?! So pretty.